If one is to believe existential rhetoric, hell is other people. But what if those other people are part of the work that you love, say, as an actor? 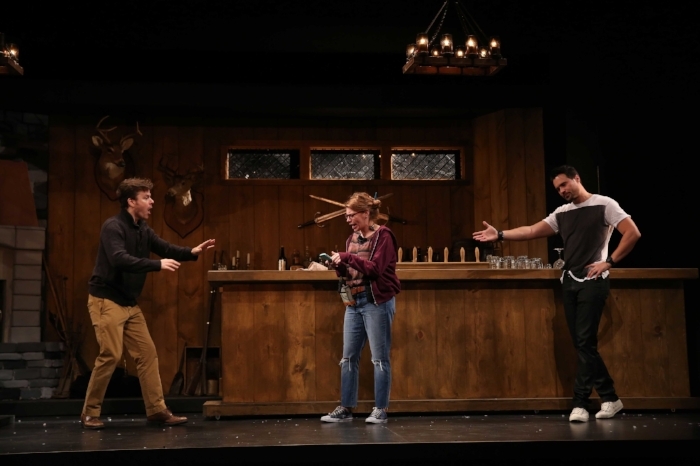 Westport Country Playhouse asks its audiences to find out in Theresa Rebeck’s 2010 work, The Understudy. Rebeck explores the pain of the modern human condition with banter and honesty, all through the eyes of two actors (and one former actor) rehearsing a newly-found Kafka play for Broadway. Franz Kafka only lived for 40 years but was enough of an influence on literature to render his name an adjective: Kafkaesque. Merriam-Webster defines the word as “having a nightmarishly complex, bizarre, or illogical quality,” although it is often misused, as author Ben Marcus laments in an article in The Atlantic. Marcus sees the definition of the word as “a setting that straddles fantasy and reality, and a sense of striving even in the face of bleakness – hopelessly and full of hope.” And that is what these three people in Rebeck’s work embody: that hope of things working out… when reality has other plans. Harry (Eric Bryant) has been given a great opportunity: to be the understudy in a newly-discovered Kafka play, which stars action hero, Jake (Brett Dalton), who Harry feels isn’t deserving of playing the part because, well, he not a REAL actor. To add fuel to the frustrating fire, Harry’s ex-fiancé, Roxanne (Andrea Syglowski), is the stage manager running the put-in rehearsal. Harry didn’t exactly leave their relationship on good terms, having abandoned Roxanne two weeks before their wedding with no explanation. On top of the tensions between the three characters, they must contend with the blunders of a stoned light board operator and an ever-present intercom system that always manages to catch the ear of the wrong person. Despite the interference, the show must go on – but will it? What is impressive about this work is that you care about these individuals, even after spending less than 90 minutes with them. Kudos to the actors and director, David Kennedy, for capturing the authenticity in these characters. For example, Ms. Syglowski’s breakdown is sincere and poignant; when she utters the line asking why men feel that women are not worth talking to, my heart broke for her. Mr. Dalton also is excellent as the accidental action hero, who struggles to find his place in the acting milieu; in many ways, he is more astute than the “real” actor, Harry. Mr. Bryant plays the character that the audience could dislike easily; Rebeck is wise to have Harry break the fourth wall to engage with the audience, otherwise Harry could come off as a superficial, self-aggrandizing jerk. Mr. Bryant’s natural charisma allows him to make unlikable characters charming, which is a gift that other actors should envy. Set design by Andrew Boyce provides elegant set pieces that glide in for scenes in the imaginary Kafka play befitting a story set in 19th century Prague. Combining the absurdity of life with the bleakness of existentialism makes this piece clever and entertaining; even Kafka himself couldn’t help but laugh out loud. Being familiar with existentialism and Kafka helps, as it adds an additional layer of humor. So, if anyone would like a lesson on how to portray genuine performances in absurdist, humanistic comedy, class is in session over at Westport Country Playhouse.